National laws and regulations as well as the standards and codes of conduct of regulated professions govern the operations of health and social services. CBVCTs may fall under one or several of these frameworks. This checklist asks questions about the main legal aspects of operating a CBVCT. Because regulatory and legal frameworks differ from country to country, it is important to find out exactly what is required in your situation. It may be helpful to get legal advice if you are unsure. Does your CBCVT have this in place? Is there a documented standard, guideline, plan, policy, procedure, contract or agreement? Is it adapted to local needs and conditions? Is it working as intended? National laws regulate the use of medical and diagnostic devices, including HIV tests. Formal authorisation to conduct a specific type of test may be required. CBVCTs aiming to offer testing technologies that maximise uptake by MSM are therefore often forced to operate in a legal ‘grey’ area. A key advantage of CBVCT services targeting MSM is their ability to provide a more or less immediate result, even though it may require confirmatory testing if reactive. This means most CBVCTs offer a form of rapid HIV testing using oral fluid or a capillary blood sample. Laws and regulations may prohibit anyone other than a medical professional to conduct such tests and interpret the results. National health authorities provide information on which tests are approved for use and under which conditions. The COBATEST ‘Guide to doing it better’ (Chapter 3.4)’ offers detailed guidance on test options and criteria for selecting them: reliability, availability, acceptability, the time it takes to obtain a result, price etc. It is important to remember that testing technology is evolving and new options become available from time to time. The European Centre for Disease Prevention and Control (ECDC) and WHO websites provide current advice and recommendations. Any new test must also be approved on the national level before it can be used at a CBVCT. When new testing technologies become available on the global market, national regulations and approvals are required before a medical test can be used legally. In addition, national regulations may impose restrictions on the settings and type of personnel authorised to administer each testing technology. Some CBVCT initiatives began testing using non-medical staff and volunteers, in many cases MSM peers, with the support of partners such as hospitals and laboratories or in the form of pilot, demonstration or research projects. Creating a precedent first, they then used their successes in detecting HIV infection and linking patients to care to advocate for formal exemptions or permanent changes to the rules. In addition, it is important to know the preferences of the key population in order to select the testing technology that will maximise access and uptake of HIV testing. Studies have revealed different local preferences, e.g. regarding oral fluid or blood samples in different settings. If you do not have data regarding the needs and preferences of your key population, it is important to investigate them in a structured way in order to base your selection of testing technology on reliable information and to assess and improve it further in the future. Selecting testing technology directly influences how clients experience the CBVCT service; it determines, for example, how the sample is obtained, how long clients have to wait for results and in which settings, including outreach, the test can be offered. To obtain needs assessment data for your initial selection of testing technology or to improve it later, the PQD (Participatory Quality Development) tool available on www.qualityaction.eu offers a range of easy to use methodologies such as Rapid Assessment or Focus Group, including step-by-step instructions. This Action Plan helps you to work directly on the items identified as priorities (yellow and/or red fields in the Checklist). Please list actions that are as specific as possible. You can download your finished Action Plans for each section as an xlsx.-document and print it afterwards. The Action Plans form the basis for your further planning, implementation and evaluation. The Action Plan shows a sequence of steps to be taken, or activities to be performed for a strategy to succeed. The Action Plan has four major elements: (1) what will be done (specific tasks), (2) by whom (responsibility), (3) by when (timeframe), and (4) how the implementation of the task will be monitored. Depending on local regulations and conditions, CBVCTs may employ clinical staff as well as social workers, counsellors and office workers. National labour laws may prescribe the way you can contract staff, their working hours and their remuneration. There may also be national laws governing volunteer work. In general, MSM checkpoints, as a type of CBVCT service, aim to operate with personnel that are MSM themselves or as close to the MSM community as possible (often called ‘peers’, see also the COBATEST ‘Guide to doing it better’, Chapter 3.3). If health professionals are required to operate a CBVCT, offering attractive positions may be difficult, especially if operations begin on a smaller scale that does not provide the scope for full-time work. For some professional groups, there may be options other than being employed directly by your organisation. For example, doctors and nurses employed by other institutions such as hospitals, sexual health clinics or public health authorities may provide services at the CBVCT by agreement with their host organisation. Social workers, counsellors and psychologists may also be based at the CBVCT without being employees, on a contract basis or as volunteers. Quality improvement tools that include sections on the skills required to achieve objectives can improve the match between the requirements of operating a CBVCT and the staffing structure and job descriptions used. The Succeed, QIP (Quality in Prevention, both available at www.qualityaction.eu), EQUIHP (European Quality Instrument for Health Promotion, www.ec.europa.eu) and Quint-Essenz ( http://www.quint-essenz.ch/en) instruments also contain sections on human resources that can be used to improve this aspect of CBVCT set-up and operations. Data protection laws govern the collection, processing, storage, use and movement of the data of living people. Personal data play a role in all health services, including CBVCT. It is important to check the applicable local laws and regulations to ensure the CBVCT complies with them in all its operations. The European Commission has published a new regulation and a directive on data protection, which Member States must integrate into their national law by 6 May 2018. This EU law means that organisations can collect and manage personal information legally only under strict conditions and for a legitimate purpose, must protect it from misuse and respect the rights of the data owners ( http://ec.europa.eu/). In addition, most CBVCTs promote ‘anonymous’ and/or ‘confidential’ services. Anonymous means that a client does not need to disclose any personal details to obtain testing (e.g. through the use of a random code). Confidential means that any personal details that clients do disclose are not passed on or accessible to third parties (e.g. by storing personal information separately from the code used for the testing process). Please see the section on counselling for additional details. To comply with national data protection laws, CBVCTs may need to adapt their operations, specific processes or forms. Ensuring that information technology systems are sufficiently protected from unauthorised access. Checking for changes to data protection laws and regulations as part of regular quality improvement activities helps ensure that all processes involving personal data are changed to reflect them. NGO umbrella organisations may offer legal updates as part of the services they provide to members. If not, it is important to investigate any new laws or regulations that may impact on the CBVCT, including those on data protection. Professional standards are work processes and codes of conduct that are described and agreed upon by professional associations. To become and remain a registered member, the worker is expected to adhere to the standards of her or his profession. This may include regular membership renewal and ongoing training. Many of the professions that provide services at CBVCTs – such as medical doctors, nurses, psychologists, social workers and counsellors – are subject to professional standards. Depending on local regulations, they must be registered with their professional governing body or association to be permitted to exercise their profession. It can be helpful for clients to have access to professional standards stating how they can expect to be treated, e.g. in regard to confidentiality. CBVCTs can, for example, display a copy of the nurses’ or counsellors’ Code of Conduct in the waiting area or the counselling room, or develop a specific Code of Conduct for all their staff and volunteers and display it. Professional associations are likely to conduct their own reviews and improvement processes for official professional standards. However, if you have developed a Code of Conduct or similar document to set a standard specific to your CBVCT, it is important to review the document from time to time with the participation of key stakeholders, including the key population, staff and volunteers. The PQD (Participatory Quality Development) tool available on www.qualityaction.eu offers step-by-step guides for a range of methods to increase participation. The law may require clearly allocated overall responsibility for the CBVCT and for particular functions. Regulations may hold particular professions or positions within an organisation liable for any claims against the CBVCT. Having the responsibility for tasks clearly allocated within the team as well as with any visiting professionals facilitates management and also helps clients understand whom they can approach with particular needs. CBVCTs use organisational charts that allocate responsibilities. It helps if these are closely related to the flowchart of CBVCT operations. Individual duty statements and job descriptions that complement the flowchart then help with recruitment, training and supervision. Responsibilities and duties can be adapted to the mode(s) in which the CBVCT operates (e.g. as a permanent checkpoint, as a temporary checkpoint, with or without mobile units or outreach activities) and to legal requirements. The responsibilities of different professions and positions vary locally. 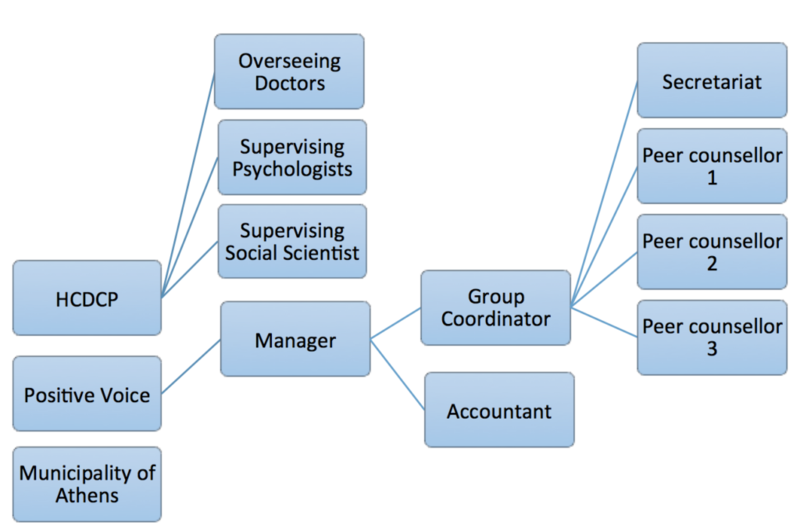 The organisational chart will also vary according to the roles that volunteers take on within operations. Reviewing operational charts and individual duty statements regularly is part of quality improvement. Participation of the team and individual staff members will increase creative ideas for improving efficiency and client service. Some CBVCTs have many people contributing as paid staff and volunteers at different times, which means that it is difficult to have meetings with everyone present. A number of short Focus Groups or a Rapid Assessment survey can help identify ways to improve organisational structure. The Participatory Quality Development (PQD) tool (available at www.qualityaction.eu) has step-by-step guides for using these methods to increase stakeholder participation in quality improvement. Operating a CBVCT carries risks, and local laws may require a minimum level of insurance. Apart from insurance covering buildings and infrastructure, this includes legal liability insurance for the organisation as a whole and also for individual professionals. Insurance requirements and providers vary greatly from country to country. It is best to get advice from an insurance specialist or from an umbrella organisation, e.g. a federation of social and/or health service NGOs. It is important to review and adapt insurance coverage regularly, especially when operations change, e.g. by adding outreach or mobile unit services, or by recruiting volunteers. Investigating the availability of coverage through government insurance schemes. Insurance may not be a specific item included in structured quality improvement tools. To regularly review insurance requirements, you could add the topic to the items discussed at annual budgeting meetings or similar, recurring occasions. How will we monitor it?